We start the day with a half day tour of Bangkok, visiting the stunning Grand Palace complex and the Royal Temple of the Emerald Buddha. The Afternoon is free for you to relax or explore more of Bangkok before boarding the overnight sleeper train to Chumporn, in a second class, air conditioned, sleeping berth. Upon arrival in Chumporn we transfer you to the direct ferry to Ko Tao, which takes 2-3 hours. The rest of the day is free for you to settle into and explore the beautiful island paradise of Ko Tao. Sometime in the afternoon we'll introduce you to the dive school and go over the plan for your diving. Today you'll start your Open Water course, which should take 4 days to complete. 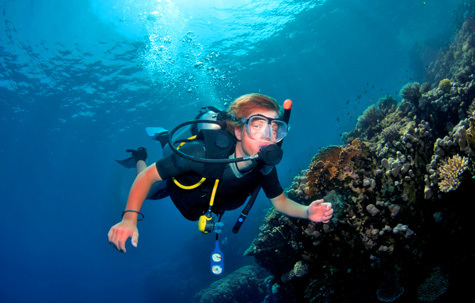 The course consists of 3 sections: confined water dives, usually in a cordoned off beach or pool; classroom lessons, where you will learn the theory and practical side of diving; and at least 2 open water dives in the presence of a qualified dive master. Today is free before you take the afternoon ferry back to Chumporn for the return overnight train back to Bangkok. Today is completely free for you to recover from the previous nights travelling and to enjoy some last minute shopping or some more sightseeing. There are plenty of optional tours you can do around Bangkok, which can be booked from our local office.